POOLGUARD/PBM INDUSTRIES, INC. has been manufacturing pool alarms, door alarms, and gate alarms since 1982. All Poolguard products are proudly Made in the USA. Poolguard Door Alarms comply with all building codes and are UL Listed under UL 2017. The majority of children that drown in pools go out the back door first and Poolguard's Door Alarm can help protect those doors. Poolguard Door Alarm is equipped with an adult pass through feature that will allow adults to go through the door without the alarm sounding. 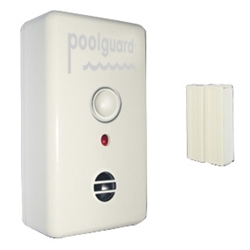 Poolguard Door Alarm uses one 9-volt battery, (not included) with a battery life of approximately 1 year.